May 3, 2016 is a day etched in my memory. I have a vivid image of me standing in the middle of a smoky playground; I feel the hot, dry air on my skin and see the orange glow from the sky reflecting off the windows of the building in front of me. On the hills to the west, I can see fire climbing trees and lighting them up like candles. I am the principal of Dr. K. A. Clark Public School in downtown Fort McMurray, and on this tragic day for our city, I faced responsibilities I had never expected. The day started as a pleasant spring morning; the weather was warm and air quality was good compared to the previous day. It had been a dry winter and an unseasonably warm spring. Over the weekend there had been two forest fires burning in the area that had left the town smoky the day before. On the morning of Monday, May 3, the air was fresh and the sky was blue. A beautiful start to the day. Suddenly the wind shifted, sending a plume of brown smoke churning over town. I received concerned calls from teachers and I tried to seek information from various sources to get an update on the fire situation. As conditions quickly worsened, we initiated our emergency procedures and began releasing students to their parents. Emotions hit me when I walked a student across the playground to meet his mother. It was then that I experienced the memory that is so engraved in my mind. 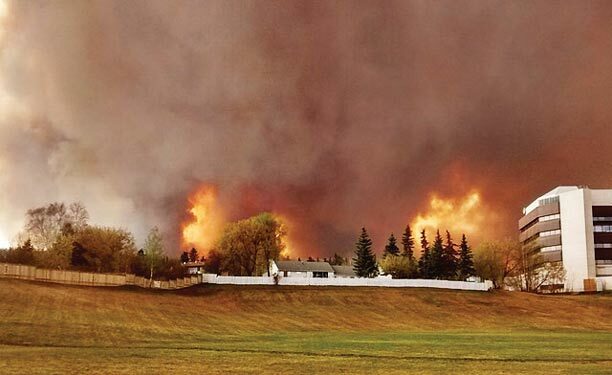 When I stood in our schoolyard and watched the flames engulfing trees on the hill above us, it was evident that our city was now on fire and homes of some of our students were burning. The reports came in of the fire spreading through several neighbourhoods. The situation became even more serious when we learned the fire had crossed the Athabasca River and was now threatening homes on the north side of the city. The river is wide, and crossing it meant the fire was travelling with fury. As staff learned that their homes were in danger, we sent them off and those who could stay supervised the students still waiting for parents. There were tears and hugs as some learned that it was too late—their homes were already destroyed. As school leader, I am responsible for the safety of all students and staff. Following our emergency plan, we released close to 440 children to their families within a couple of hours that afternoon. When we did our final check of the building and locked up the doors, two students remained in my care. When I climbed into an evacuation bus with those two grade 7 students, I had no idea of the journey we were about to take. The parents of both my students were evacuated to locations with no access out due to the fire threat. Thankfully, with the help of a neighbour, my own two sons were able to meet up with our bus and join me as we evacuated the city. Over the next several days, our adventure took us on three bus trips, to two work camps (one of which later burned to the ground) and visits to evacuation centres as we continued to be moved away from the threat of fire. In the early hours of May 5, we finally arrived in Edmonton and were met by my in-laws who welcomed us all into their home. We made arrangements to meet the students’ parents when they would eventually be flown out of the work camps north of Fort McMurray. On May 5, the first of the two students was reunited with his family at the Edmonton evacuation centre, the second had an emotional reunion with his mother on May 6, four full days after our journey began. For a month, our community was left in the hands of firefighters and other emergency responders who worked tirelessly to protect the areas still standing. My first visit back to the school was on June 13 when I toured the building with the restoration contractor and insurance adjuster. Our school is located in the valley below one severely affected neighbourhood, directly to the north of another. In a school—where students may have allergies and sensitivities to smoke—there is a high standard for air quality. There was a lot of work to be done to remove anything that would have absorbed smoke. Restoration lasted until mid-August when we finally were able to start moving back into our building—every ceiling tile, every bulletin board and any teaching resource that may have been smoke damaged had been removed—and we could finally start the process of moving forward for the new school year. As I reflect on the days of the evacuation, I am grateful for many things—88,000 people were safety evacuated and much of our community was saved thanks to the hard work of emergency responders. As school principal, I am thankful for a staff who were able to work quickly to connect with families and efficiently release students to their parents under the most stressful of circumstances. I am thankful that I was able to get to my own children as we evacuated; I can’t imagine the emotions the parents of my two students would have felt not being able to reach their children. In such a difficult time, I hope I was able to give these parents peace of mind and assurance that their children were safe in my care. We are now several months into the new school year and I am happy to see our families return with optimism and a sense of community. We are working together with community agencies to support our students when they need it, and we are focused on helping our students develop resiliency. We will get through this. As a community we are strong: #FortMcMurrayStrong. Merrie-Rae Mitsopoulos is the principal of Dr. K.A. Clark School in the Fort McMurray Public School District in Alberta.